First thing’s first, we’ll take a look at the health of your trees (if they’re stills standing after a storm). With some trees, we may be able to save much of the tree. In other instances, it may be best to completely remove the tree. We’ll assess the state of your tree, and offer up our best solution. If a tree can be saved, you can rest assured that we’ll have a plan to make sure it has its best shot at thriving. We may recommend cabling and bracing trees that are in danger of toppling. Or, if you have a tree that is in pour soil, we can fertilize your tree to ensure that it has the nutrients it needs to grow strong. Of course, if you have dead tree limbs around your property, we’ll remove them. We work with some of the largest trees and in some of the most peculiar situations, yet we remain efficient and safe. If you have a large tree on your property that has a severed limb at the height of the canopy, for instance, we’ll safely scale your tree, tether the limb to ensure that it doesn’t fall on your property, cut the limb, and lower it softly down to the ground. Once we’re done with all of your tree care needs, we’ll ensure that your property looks as good as it did before the storm. We clean up and remove any tree debris that’s on your property. We want your home to look great, starting with your trees. If you have a tree that’s severely damaged, we can remove it entirely. Some trees simply topple in the wake of a big storm. Others lose too many limbs to survive. And others still can die simply due to an unfortunate lightning strike. When these most unfortunate events happen, we’re here to safely remove the hazardous tree on your property. 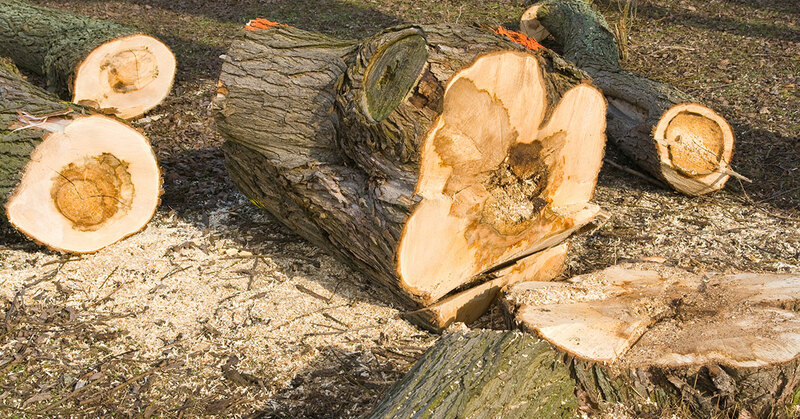 We can cut your tree down to the stump, and, if you’d like, we can remove the stump with a stump grinder as well. Our stump grinder is a heavy-duty machine that uses a toothed blade to bite and tear through your stump. We remove enough of the stump so that it is below the grade of the surrounding earth. You’ll be able to plant grass where your old tree was, if you prefer. OK, it’s not really an emergency service, but we can plant new trees to replace any of the trees of the last generation. Bring life back to your property with a variety of new trees that will grow just as big as the last. We’ll work with you to determine the perfect trees for your property, and the ideal locations to plant your new trees. Fast response at any time of day. Full assessment of the situation. Speedy removal of any limbs, branches, or tree debris. Complete disposal of the tree. Take note, we also provide demolition services. So if you have property that has been damaged, in addition to the trees throughout your landscape, you can count on us to demolish those structures, remove those trees, and help you to get a fresh start. If you’re ready to get started, don’t hesitate to get in touch with us. We’ll give you a quote and we’ll get to work right away!